* Disclaimer: The following opinions expressed are those of the authors’ Shauna Tomkins and Geoff Rashbrooke and are not intended as legal or financial advice. Statements continue to be made about the FNPF reforms that are simply not true. Predictably, the termination of the pension scheme has been met with anger and cynicism by those affected who even question the need for reforms in the first place. Many pensioners understand that the new life annuity arrangements are offered at a much lower conversion rate and alternative investments will not generate the returns enjoyed under the old life annuities arrangements. The reason is obvious ù there are no investments available to support pensions at a rate of 25 per cent or even 15 per cent that are of an acceptable risk for individuals or FNPF for that matter. There never were. Prior FNPF boards, management and successive governments ù elected and otherwise ù failed to implement a proper fix to the problem. This is despite 20 years of warnings by the International Labor Organisation, World Bank, IMF, actuaries and special advisors. The 1999 changes did little to solve the problem. Ironically, subsequent drives to encourage taking the life pension at entitlement only made the problem worse. Unfortunately, those pensioners most affected by the termination/refund plan will not be satisfied with anything other than the status quo ù no change. While an easy solution may have been to change only conversion rates on future pensions and leave the past pensions alone, to do so continues to discriminate against working members in favour of pensioners and compounds past mistakes. Status quo would mean that members continue to pay for the next 30 years. It means a 25yo in the work force today retires with potentially 30 per cent less because earnings must be redirected to pay these pensions. The self-interest is understandable and so it is no surprise that mis-statements continue to be made by those who believe that they have the most to lose. The silent majority who will benefit from the changes remains just that ù silent. Here are the 10 biggest myths about the FNPF reforms. * Reality: The FNPF scheme is established as a self-funded retirement savings scheme ù this is the foundation stone for sustainability. It should mean that the amount available to people at entitlement is the amount saved during their working life. This has not been the case for the 11,000 or so current pensioners whose pensions are not self-funding but rely on around $30 million every year to be diverted from crediting members to paying the pensions. Even at the lower conversion rate of 15 per cent from 25 per cent requires FNPF to earn returns of more than 13 per cent. Such returns have never been achieved and are not available. Therefore, FNPF must divert money from members to make pension payments. In the 1990s, the International Labor Organisation alerted FNPF that less than 10 per cent was sustainable. The suggestion that sustainable conversion factors be applied only to new entitlements would stop further deterioration but fails to address the funding shortfall on existing pensions. This shortfall would need to be paid for by current and future generations of contributing members for the next 30 years. There have also been calls for a minimum pension. FNPF cannot fund a minimum pension in excess of what a member has saved. The issues relating to minimum wages, meaningful employment opportunities, provision of a universal pension and poverty alleviation are the responsibility of Government not FNPF. * Reality: Under the old Act, pensioners did not have a contract with the FNPF. The old Act allowed the minister to decide that persons entitled to receive their fund balances could instead receive a life annuity based on their account balance (in full or part). The pensioner did not have to enter a contact with FNPF to receive those balances as an annuity because the old Act created the entitlement. The FNPF Board’s obligation to pay the annuities comes from the old Act. There is no question of a contract. So when the old Act is repealed with effect from 1 March 2012, the entitlements of pensioners will also be repealed. Despite this, and despite the payments made over the years to pensioners (in some cases amounting to multiples of their original balances) the FNPF Board is required by the new Decree to make a refund to those pensioners of the original amount converted to an annuity. The Decree does not seek to recover any payments made to date, in effect, tax free returns of up to 25 per cent. The legal correctness of this analysis has been confirmed by the Solicitor General. * Reality: The assets of the FNPF are not owned by either members or pensioners ù they are owned by the FNPF Board. The FNPF Board is not owned by members or pensioners in the way a company owned by its shareholders. This is because the FNPF Board is a statutory body. No-one has shares in the FNPF Board. Contributing members of the FNPF have the same basic relationship as a depositor with its bank. The FNPF Board has “fiduciary obligations” to contributing members. This mean the Board has obligations to act in the best interests of contributing members in managing the funds. These fiduciary obligations are emphasised by the new Decree. 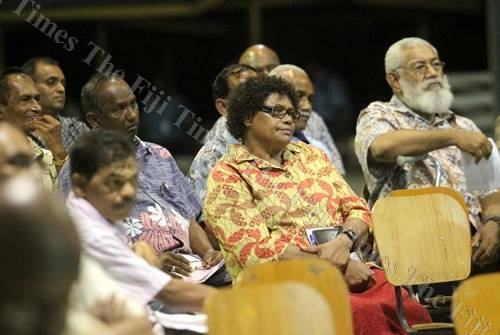 The interests of pensioners are protected under the new decree by the detailed and extensive prudential and solvency requirements to be enforced by the Reserve Bank of Fiji. The requirements are designed to ensure that there will be sufficient assets to pay ongoing liabilities, even if there are adverse circumstances affecting the value of the rest of the assets of FNPF. It should also be noted that FNPF is not owned by the government. It is a statutory authority, and government has responsibility with respect to certain governance matters, but without ownership of the assets ù which are applied in accordance with the law to make payments to members and pensioners. * Reality: The reforms have been long overdue. The reforms are comprehensive and address structure, solvency, refocus on retirement, prudential regulation, governance, greater independence from political interference and sound risk management. The reforms are robust and aim to avoid a repeat of the current problems. They should also mean better and more appropriate retirement products, improved efficiency and less red tape, and better returns for members. Current pensioners have enjoyed the greatest benefit from the past mistakes in the design of the annuities scheme. The FNPF Board understands well and grappled with the possibility of financial hardship for some pensioners but on balance committed to the adjustments to achieve fairer outcomes overall. At 30 June 2011, the amount to be set aside (technical provisions) to support future pension payments of all pensions current at that date was $565 million. The FNPF Board, underpinned by the Transition Decree, will apply a large part of this amount to pay around $310 million in refunds plus up to $100 million in top up payments to support those pensioners who decide to take up a new life annuity product. The remaining $150 million or so will support the FNPF Board to meet member liabilities and the new solvency requirements. That is, more than $400 million goes to support the 11,000 pensioners and $150 million goes to support the 300,000 workers. * Reality: Section 10 of the FNPF Act is often identified as a government guarantee of FNPF. It is not a guarantee but a liquidity facility. The section provides for the government to make a loan to FNPF and then takes priority for repayment. Given that 70 per cent of FNPF assets are in government bonds that can be turned easily into cash, FNPF could keep making payments even when insolvent. That is, it could have cash in the short term but in the longer term, the value of liabilities would be greater than the value of assets. Without reforms, this balance sheet insolvency could occur as soon as 2018. * Reality: The Pension Buffer Contribution levied to support the unsustainable 25 per cent conversion rate has characteristics of a Ponzi scheme. A Ponzi scheme makes the promise of fabulous returns — well above realistic market returns and then uses money from new “investors” to payout those who leave the scheme. As long as the number of pensioners was very small, this levy from hundreds of thousands of workers was adequate to make the generous payments to the lucky few. After the contributions were terminated in 1999, the overt 2 per cent cross-subsidy was replaced by a “levy by stealth”. This levy was the reduction in distribution of earnings to members through a lower crediting rate. The Pension Buffer levy was fundamentally unfair and had the effect of taxing the poor and giving to the rich, that is, it was a wealth transfer to those people who did not access FNPF savings until entitlement. Much has been said about the earnings on the Pension Buffer Contributions and that had these been credited to the reserve there would have been adequate funds to meet ongoing pension obligations. While this would have delayed and narrowed the funding gap, it was not a fix. In any case, the reality is that those earnings were used by the FNPF Boards in the 80s and 90s to bolster the crediting rate to members above the actual return on investment achieved at the time. This money cannot now somehow be recovered and written back to the reserve. In fact most of today’s pensioners have already enjoyed these earnings because the value was reflected in their savings at entitlement. * Reality: It is human nature to not want a change that takes away some personal advantage. If change is inevitable then the next best thing may be to delay implementation. The problem is that no amount of delay or consultation or rational argument will convince every pensioner that the reforms and termination/refund approach is a good thing. Clearly, for those who will no longer receive generous payments that are subsidized, it is not a good thing. However, every month the FNPF delays costs the membership more than $2 million in transfer payments. The calls to wait for the 2014 election would make the problem worse and could cost members another $100 million. * Reality: The problems with FNPF and the bad design of the annuity arrangements go back to 1975. Successive Boards and governments — elected and otherwise — failed to heed the warnings given by multiple experts over nearly 20 years to fix the problem permanently. The failure to take on proper actuarial advice with respect to conversion factors; failure to restructure FNPF activities to separate insurance and savings businesses; investment decisions such as ATH and Natadola Bay all pre-date the current government and Board of FNPF. The FNPF Board and government inherited these problems and have a long standing commitment to putting FNPF on a sound prudential footing. * Reality: The pension scheme was flawed fundamentally regardless of past investment decisions and write-downs. Even at the lower conversion rate of 15 per cent, in 2002 the ILO pointed out that technical provisions to support such annuities are $2 for every $1 converted. That is, the day FNPF accepts $10,000 in savings to be converted to a life annuity at 15 per cent, it must set aside $20,000 to support those future payments. The extra $10,000 must come from assets supporting member liabilities. Therefore, the Natadola Bay losses and underperformance of a minority of assets has not contributed to the pension problem. In any case, it has been the members who have borne the brunt of any poor investment performance through lower crediting rates. The investment issues do highlight why the need for other reforms relating to decision making, board responsibility, transparency and accountability, board independence and risk management are so important. * Reality: FPNF must use life expectancy tables based on pensioners and not the general population. This is standard insurance practice. Based on experience in other countries, pensioners usually live longer than the average population because they start in better health at entitlement and have greater means to obtain medical care. FNPF continues to collect data to improve its forecasting and modeling with respect to life tables but the adjustments that have been built into the model are consistent with the World Health Organisation experience in improvements and are considered modest for a pensioner population. This is a factor that will be monitored closely over time but will not have the wishful impact that some opponents to the reforms have suggested. Opponents of the reforms conveniently ignore the long time warnings from the ILO, World Bank, IMF, actuaries, regulators and specialist advisers. As recently as last month the IMF once again called for reforms of the pension scheme. However, the alternative economics and financial rationale presented by opponents to reforms lack an understanding of long tail insurance products and even basic financial mathematics. The Fiji National Provident Fund is a pivotal institution in the Fiji economy and the lives of many Fijians. The decisions made today impact operations and the well-being of 300,000 workers for the next 40 years. The FNPF Board has been brave and taken a comprehensive approach to try and deliver a balanced solution rather than just cherry pick the reform package and only apply those aspects that were easy or non-controversial. Pensioners are not being victimised although clearly some individuals will feel a greater financial impact than others. There is no surprise in a number of pensioners claiming that they are being victimised and that they are the big losers in these reforms. The reality is that they are not big losers – they have just stopped winning at someone else’s expense. * Disclosure: Shauna Tomkins was engaged previously by FNPF to provide technical assistance on the reforms of the FNPF Act. Geoff Rashbrooke is contracted currently to provide technical assistance to FNPF on developing actuarial and data analysis capacity. * Disclaimer: The opinions expressed are the authors’ own and are not intended as legal or financial advice.